When in doubt, throw pompoms at it. This vest top shows just how it’s done with a colourful trim on the yoke that complements embroidery detailing on the neckline. Pair with shorts for a carefree-but-considered holiday look or add jeans for casual evenings. Be a butterfly for the day in this ruffle-sleeved jersey top. 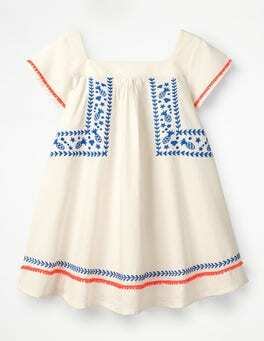 We've added a fun pom-braid trim around the neck, as well as delicate keyhole detailing at the back. Wear with a tulle skirt for maximum flutter power at parties. 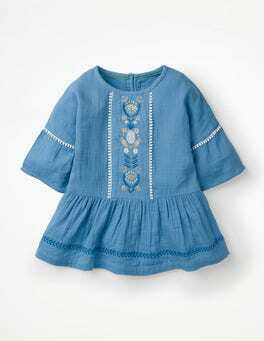 This cotton top with its fluted sleeves, peplum frill and pom-braid trim is a go-anywhere, do-anything kind of garment. The delicate embroidery on the front panel and at the hem has a touch of sparkle in it for good measure. A contender for top of the tops? Most certainly. Made from double-cloth cotton this longer-length top is as cosy as can be. The frilly sleeves and a peplum hem are dressy enough for tea parties and it's got a bright pompom trim for an extra pop of colour. It slips on easily over leggings for afternoons in the park, too. A sweet berry print, a playful ruffle, and a bright pom-braid trim. Sounds like the perfect top for a summer's day to us. Early morning wake-ups? The elasticated neckline makes getting dressed easy-peasy. Off on an adventure? 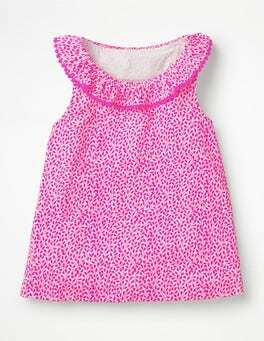 This vest's full shape means it's loose and breezy for all-day playdates.